No Power – No Worries – You can still eat healthy! A manually powered kitchen tool that spiralizes vegetables. It comes with three blades. It’s easy to clean, and to store. Inexpensive. No batteries required, completely manual. Fun to use. Fast preparation. If you’re in a power outage – no worries. You can still have fresh spaghetti, provided you have zucchini. Aside from power outages, this clever kitchen tool comes in handy when you’re in a hurry. Just put a zucchini through the spiralizer. Within seconds you’ll have a large serving of fresh zucchini spaghetti. Cover your zucchini pasta with your favorite sauce. Break open a jar of Rao’s, Trader Joe’s, or Whole Foods Four Cheese tomato sauce. Since the cheese is already in the sauce, you don’t have to grate parmesan, or romano onto your veggie pasta. If you have time, you can add sautéed mushrooms, garlic or onions to this pasta dish. Zucchini is a bland vegetable, so don’t hesitate spicing things up with cayenne, black pepper, or chile pepper. Zucchini pasta, is grain-free, so it’s good for anyone who wants to avoid grains. If you don’t like eating raw carrot sticks, spiralize a carrot stick instead. A sprialized carrot is thin and crunchy. Drizzle your favorite dressing over the raw carrots. Experiment with other raw veggies, mix them together in a salad bowl, add dressing, and enjoy. 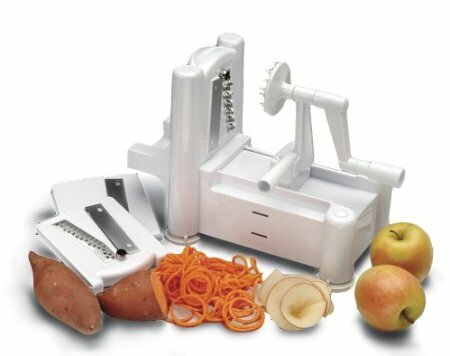 The spiralizer is not a toy. The blades are very sharp, so don’t let your children use it. The cheese I’m referring to is Pecorino Romano, a sharp, dense, flaky-textured, aromatic Italian cheese, used for grating. If you’re on a salt-restricted diet, this cheese is not for you. Another way to eat Pecorino Romano is to slice off pieces, and place it on a slice of crusty bread or fruit. Pears are an excellent complement to the salty cheese flavor. Great for snacks on your next hiking trip. The name Romano refers to the ancient Romans, who began making this cheese 2000 years ago. 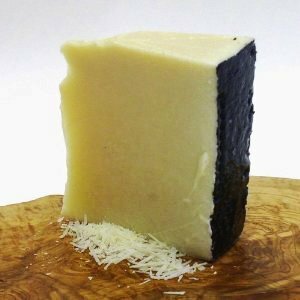 Made from sheep’s milk, Pecorino Romano was a staple in the diet of the legionaries of the ancient Roman army. Because of its high fat content, a little goes a long way. It’s also high in calcium, and that’s a good thing. Sharper than Parmesan, Pecorino Romano has also been described as hearty, bold, full-flavored, briny, and pungent. Not to make it a daily habit because of its high fat content, but something of a treat. Good to take on backpacking trips because this cheese won’t spoil easily. Trader Joe’s sells grated and solid Pecorino Romano, at very reasonable prices. Cinnamon is a warm, aromatic, spice. It was used in ancient Rome, Egypt, and China as a spice and a medicine, and was considered to be as valuable as gold. Cinnamon bark is harvested from cinnamon trees, and sold in sticks or powder. 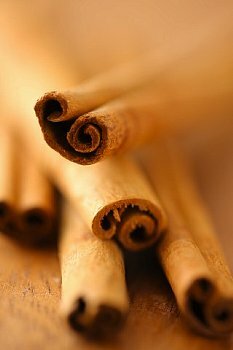 The most common types of cinnamon are Ceylon, and Cassia. Ceylon is sweeter, lighter in color, and softer in texture. Ceylon cinnamon sticks are easily ground in a coffee grinder. Cassia is less expensive, more common, and sold in supermarkets. Buy organic for fresher flavor. Store cinnamon in a glass jar in the fridge. It will remain fresh for six months. To save money, buy bulk from a local health food store, or food co-op. To preserve flavor, buy Ceylon cinnamon sticks, and grind them in a coffee grinder, as needed. Top your cappuccino, or latte with powdered cinnamon. Make tea from cinnamon sticks. Add cinnamon to granola cereal. Stir hot cocoa with a cinnamon stick. Sprinkle cinnamon over French Toast. Add cinnamon to a smoothie. Stir cinnamon into warm oatmeal cereal. More about cinnamon health benefits here. As a group fitness instructor, and personal trainer, I’ve seen, and heard alot of dumb things. Here’s a perfect example of an all-too-common dumb exercise mistake. Don’t take exercise advice from friends. Instead get a trainer to give you professional guidance. If she did, you wouldn’t be on the floor. Your friend doesn’t know what she’s talking about. Falling off an exercise ball may cause a broken arms or head injuries. Sporadic or inconsistent workouts keep you from reaching your fitness goals. Overdoing your workouts, and then taking pain killers so you can go back for more. Working your upper body and not your lower body. And vice versa. Taking exercise advice from friends. Hire a personal trainer instead. Never learning correct exercise techniques, or how to use equipment. Exercising on an empty stomach. Good way to get dizzy. Having an unbalanced exercise routine. You need cardio, strength, flexibility, and stress management. Taking an advanced Pilates class, when you’re core is weak. Causing self-inflicted injury when you overloaded the bar. Thinking that working out is equivalent to torture. The best way to avoid dumb exercise habits, is to hire a personal trainer. You’ll actually save money by doing so, because a trainer can teach you correct technique. When you understand the right way to exercise, you’ll avoid costly injury, and reach your goals much quicker. Sit with your back straight. With both knees forming right angles, place knees directly under the knee pad. Grip the overhead bar slightly wider than your shoulders. 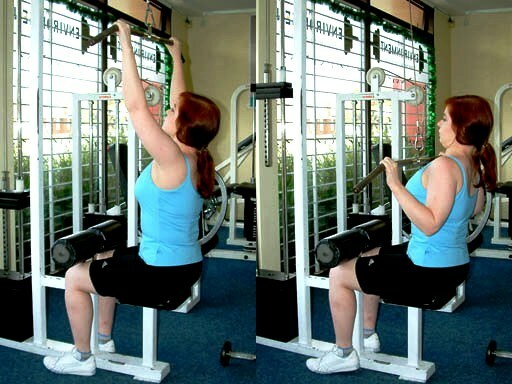 Slowly pull the bar to chest level, moving elbows behind you, drawing shoulder blades together. Slowly return the bar to the start position. Keep movements smooth, slow and controlled. Exhale as you bring the bar down. Inhale as you release the bar up. Do not bring the bar behind your neck. Doing this, may lead to injury. Do not throw your head back. Do not overload the bar with too much weight. Doing so, may lead to injury. Do not attempt this exercise if you experience pain. Do not yank the bar down. The exercise described in this post is informational, and not meant to replace the guidance of a personal trainer in a live setting. Exercises performed incorrectly may result in injury. IRENE PASTORE, Certified Personal Trainer, business owner, health and fitness educator. I was born and raised in New York City, and taught fitness there for more than 20 years. My specialty is core training for adults of all ages and sizes. Visit the About Page, to read my full bio, and how I can help you achieve your fitness goals. Tour de Core Personal Training Is Available Locally and Remotely. GOT A DOG, CAT, OR HORSE?